The Hot Wheels ’50s Chevy Truck debuted in the 2006 Ultra Hots line. This yellow version was released after a nice dark red version but preceded a harder to find, matte blue version. However, this version was the only one of the three to feature any graphics (beyond the headlights and pinstriping). So what is “MATWIJIW Organic Farms”? Well if you have ever noticed, a lot of Hot Wheels castings feature names or graphics/logos of made-up brands. If you are familiar with the Hot Wheels designers/graphic artists, you’ll recognize some of them such as “El Wood” for Larry Wood or “Clone” for Mike McClone or even “Tuske” for Brendan Ventuskey. In 2006, a lot of collectors wondered who/what “Matwijiw” was–let alone, how to say it. While I am still unclear on how to pronounce it, “Matwijiw” is the last name of former Mattel Project Management Specialist, Lisa Matwijiw. She managed the collaboration between US design, graphics, marketing, and packaging teams to successfully launch new Hot Wheels Adult Collector premium product lines. So the graphic on the ’50s Chevy Truck was essentially a nod to her. 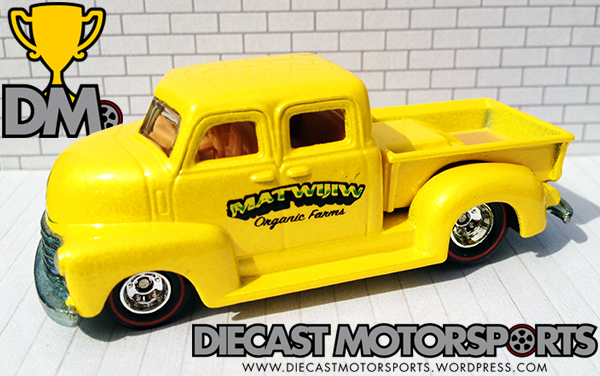 Lisa left Mattel in 2010 but she helped bring collectors some cool lines and products–such as the Cars Motor Speedway of the South & a very familiar casting, in the ’50s Chevy Truck, in the HotWheelsCollectors.com’s Series 6 Real Riders. So next time you see a funny looking name on the side of a Hot Wheels casting, or a made-up brand, check back here and click the #CARS FEATURING NAMES OF MATTEL EMPLOYEES tag and see if we’ve covered it already. RELEASE DETAILS: Metalflake Yellow Body (metal). Clear Windows. Tan Interior. Chrome Deep-Dish Real Riders Wheels w/ Redlines. Unpainted Metal Base. Made in Malaysia. Toy# J7155. Released in 2006 as part of the Ultra Hots line.